Early 800 serial number range 1928A1 Thompson submachine gun made by Auto Ordnance in West Hurley, New York. 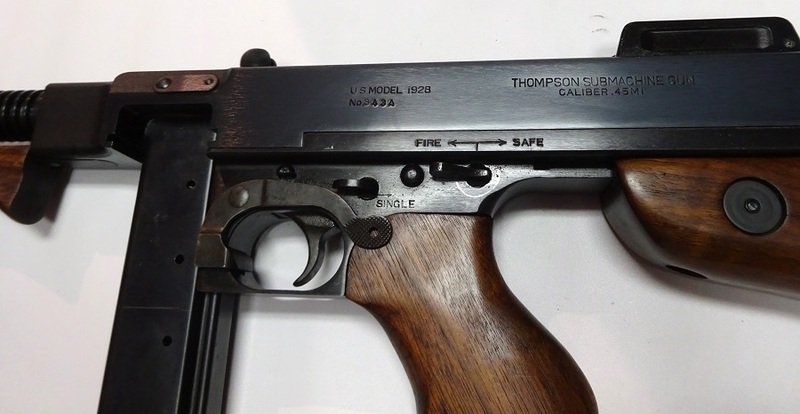 This Thompson looks and handles and operates just like the Colt Thompsons of the Roaring Twenties, but is priced at $23,500, much less than a Colt. Since the 1980’s it has been in the safe of the dealer that purchased it new. Probably not fired 500 rounds. Not perfect but inspect the pictures – nearly so. Comes with a five pocket magazine pouch with 20 round magazines and a three pocket pouch with 30 round magazines, all in equally pristine condition. I have only test fired it – see video. Call on questions 877-437-0251.